Decimals, negative numbers, equivalent fractions and nets of 3D shapes... does your child find any Y5 maths topics tricky? 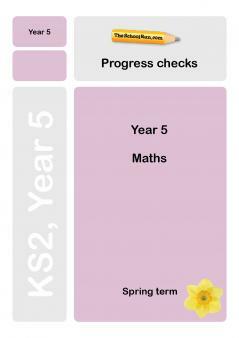 Our Y5 maths progress checks, written by a teacher, are designed to help you see how your child is progressing and identify any areas where they need some extra practice. Our Y5 maths Progress Checks, prepared by a KS2 teacher, will help you identify any areas your child is having trouble with so you can support their learning at home. Knowing percentage and decimal equivalents of 1/2, 1/4, 1/5, 2/5 and 4/5. What your child learns in Year 5 maths is explained in our parents' guide; you can also look through all our Y5 maths worksheets or follow our Learning Journey for Y5 maths.